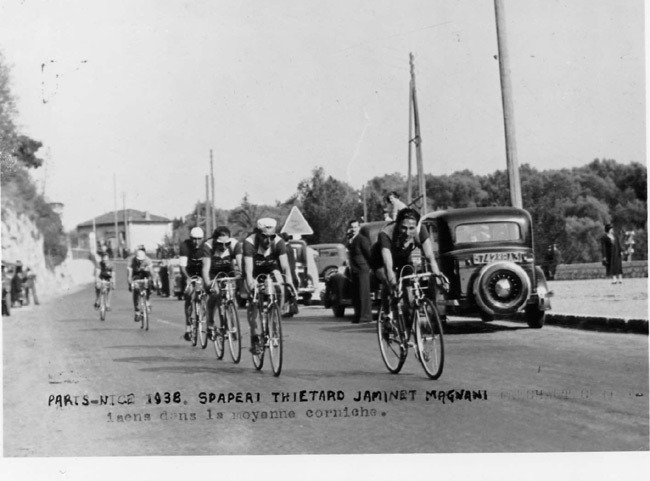 Who Was the First American to Race in the Giro d'Italia? Well respected Author Peter Joffre Nye's research would indicate that it was Joseph Magnani who raced in the 1946 Giro d'Italia (see story below). Nye is the author of "Hearts of Lions: The Story of American Bicycle Racing" and is currently working on writing a biography of Albert Champion of Paris who won Paris-Roubaix and gained fortune in America as founder of Champion Spark Plugs and then helped to build General Motors from a holding company into the world's largest company with his division surviving today as AC Delco. 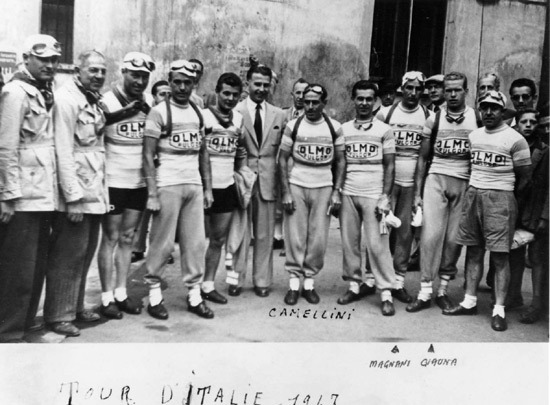 An unknown source has claimed that the winner of the 1924 Giro d'Italia, Guiseppe Enrici (January 2, 1896 - September 1, 1968), was in fact born in Pittsburg, PA, which made him a U.S. citizen. 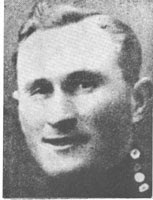 He would also be the first American to start the Tour de France (1924, DNF on 4th stage; and 1925 DNF on 11th stage). He passed away in Nice, France. 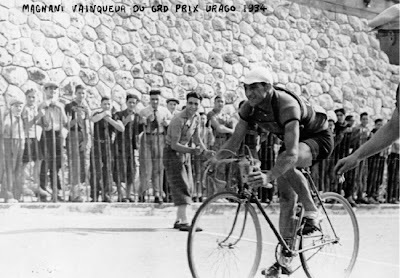 The Gazzetta dello Sport in a story about the history of foreign riders at the Giro d'Italia wrote, "In 1949, Italo-American Angelo Di Bacco was the first rider to represent North America...". Perhaps they have forgotten about Joseph Magnani as well? 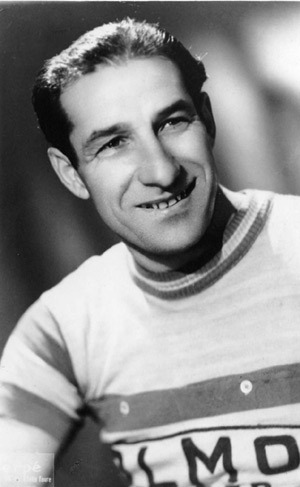 In international cycling, Magnani--routinely referred to in French accounts as l'Americain--earned a reputation as one of his generation's strongest riders. His reputation has proved durable. Several photos of Magnani in his prime years recently turned up neatly framed and mounted on walls of a Washington, D.C., restaurant. One photo shows spectators cheering Magnani as he crosses the finish line triumphantly in the 1934 Grand Prix Urago in Nice. Another catches him peeling off after his turn leading the breakaway during a stage of the 1938 Paris-Nice, on his way to finishing ninth overall. In another photo, he stands with the bicycle manufacturer Giuseppe Olmo and Olmo team riders and support crew at the start of the 1946 Giro d'Italia. The 94th edition of the Giro d'Italia will celebrate the 150th anniversary of the unification of Italy ("il Risorgimento"), and will start in Torino (Turin) on May 7, 2011. 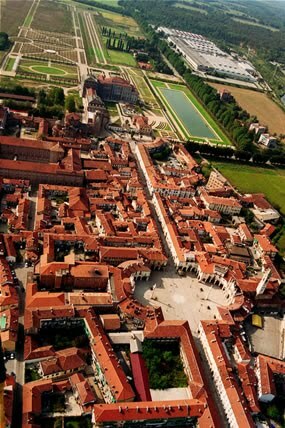 Torino was the first capital of unified Italy. 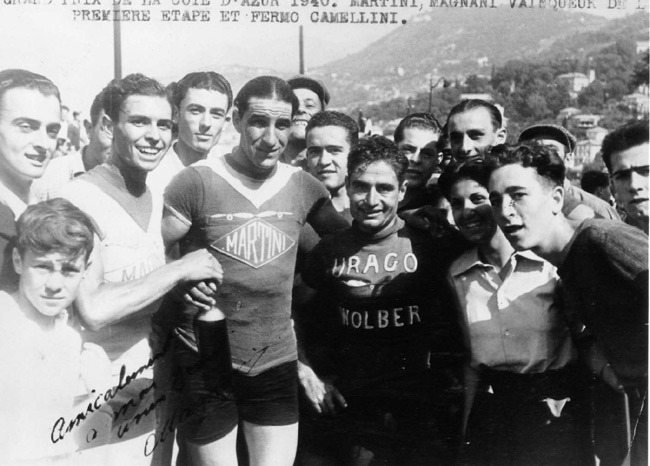 Torino has only once hosted a Giro start, in 1961. Read more about the unification of Italy here. The contest is open to USA citizens, no purchase necessary. Read rules here. 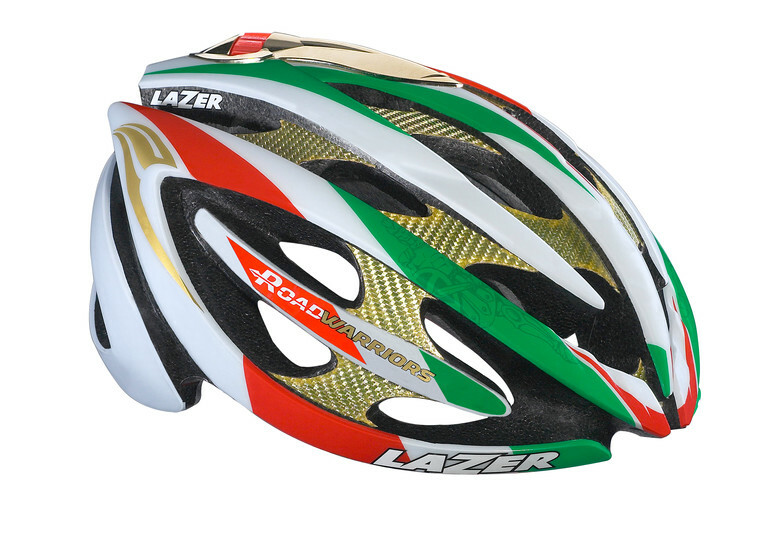 "Renzo’s Formigli's passion for cycling runs in his blood. 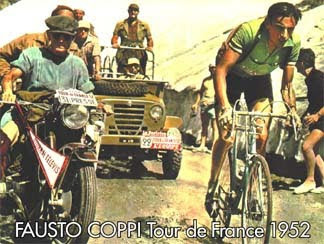 His grandfather, father and brother were all professional cyclists. When Renzo was 12 years old, before and after school, he would linger at the bicycle shop in his home town of Florence, Italy. Through listening to builders he began to understand the mechanics of a bicycle. At the age of 19 Renzo met the man that would forever change his life. By luck, Renzo befriended Cino Cinelli, one of the most famous builders in the world of handmade frames. It was through Mr. Cinelli that Renzo learned the art of hand crafting racing frames. In 1990 Renzo created Formigli cycles with the mission to use modern technologies to re-create the custom, hand made frames that are the legend of Italian frame construction. Like an old fashion tailor, Renzo Formigli has perfected the art of custom frames built through his own proprietary process. Formigli frames are one of a kind and the highest quality racing frames available on the market." Read how Formigli has come to establish a subsidiary in the USA, here. New De Rosa Model for 2011: R848 or "Vega"
A completely new model in the De Rosa lineup for 2011 has been on display in Italy. The caption of photos taken by Cicli Balduzzi identify the bike as a "Vega 848". The photos of the graphics on the bike show "R848". Say what you want about me for being honest and posting under my company name Trialtir who also happens to be the importer. De Rosa makes some of the finest bikes on the planet and I'm happy to let people know my opinion." This summer I had the good fortune of chasing down my dream of climbing Mount Ventoux (on my bicycle). I signed up for a trip with Eros Poli, recommended by my friends. I had heard so many inspirational things about Eros Poli – the least of which was that he won the Mt. Ventoux stage in the Tour de France in 1994. Two friends from my cycling group, The Bedminster Flyers also signed up for the trip. We were excited to experience the epic climbs Telegraph, Galibier, Glandon and of course Ventoux. So, I signed up, with two goals in mind, one to make it up Mount Ventoux and the second, to come home with a story for the Italian Cycling Journal. As the trip started I remembered the story of my first Pinarello bike – the beautiful blue Stelvio frame which I still own. 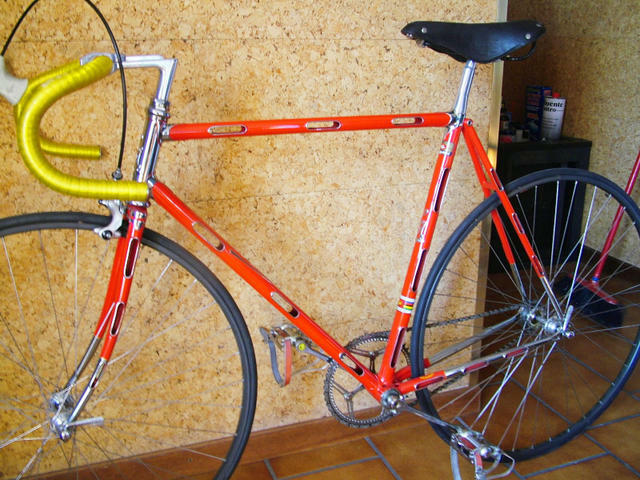 When I was racing I had always wanted a Pinarello frame but could not afford it. Then, a strange series of events took place. I was in a small fender bender and the driver who hit me decided to pay the expenses for my car out of pocket – to the tune of $1,200.00. This was the exact amount I needed for the Pinarello Stelvio frame I had always wanted. So, I did what any good cyclist would do... I drove directly to the bike shop, handed over the money and placed the order for the gorgeous frame. I was fortunate enough that the mechanic at the shop offered to build the bike for me with used parts from his old racing bike so that the rest of the bike wouldn’t cost so much. I was thrilled, and it made driving around with a dent in my station wagon that much less difficult. I shared my story with my friends on the tour and it made riding the Pinarello Prince that much more meaningful. In addition, we were ending our trip with Pinarello Granfondo Cycling Marathon which started in Treviso, Italy. 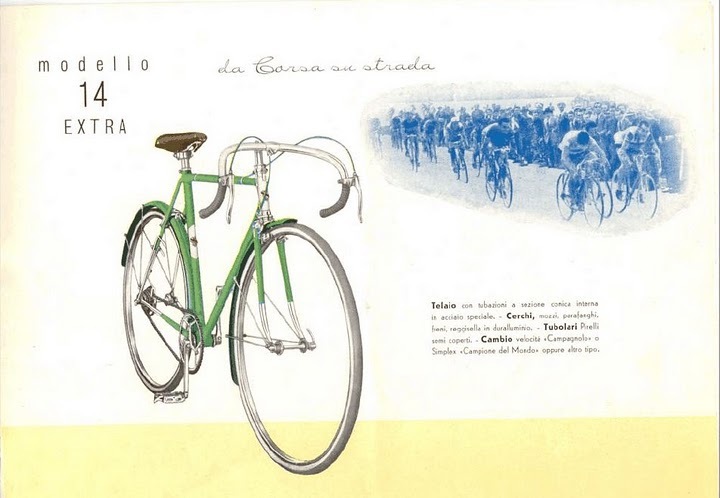 Eros Poli was sponsored by Pinarello as a racer and knew the family well. He brought us to their beautiful shop in Treviso where we met Giovanni Pinarello himself! I was in awe! I couldn’t believe I had the chance to meet him and his family too. Mr. Pinarello was very gracious, kind, humble, and generous – it was an honor to meet him. Later, after the marathon was over, we saw Giovanni Pinarello again. I was eager to have a picture of him to keep along with the other Pinarello stories that seemed to weave themselves into my life. Eros saw Giovanni sitting with a friend and asked him if I could take my picture with him. He agreed. I had just finished the marathon and was covered with mud, sweat, energy drink, and probably lots of biscotti crumbs too – but didn’t want to miss my chance. 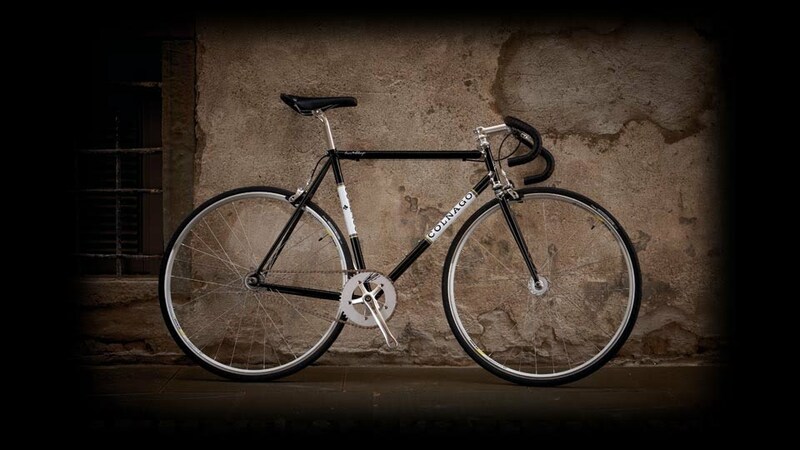 I walked over with my Pinarello Prince and then Giovanni looked at Eros and said “She has a beautiful frame!” Eros, pointed to my bike and said, “Oh Yes, the bike!” and Giovanni said, “No, Her!” From then on, “The Frame” became my new nickname. So there it is, my Italian Cycling Journal story. I felt so blessed to meet Gioavanni Pinarello – especially given the way I felt about that steel Stelvio frame. I also felt so privileged to ride up Mount Ventoux with the encouragement and inspiration of Eros Poli, a world champion, gold medalist and Tour de France stage winner. The miracles within the whole trip still astound me! And honestly, I don’t mind saying that being called a “beautiful frame” by a man with an eye for designing revolutionary racing frames made the broth that much better! Wishing you great climbing, a chance to ride a Pinarello frame, and the chance to be with inspirational cycling heroes from all over the world! Alberto Contador has won his 3rd Tour de France after a memorable duel with Andy Schleck who finished 2nd, 39 seconds behind. Schleck won the young riders classification. 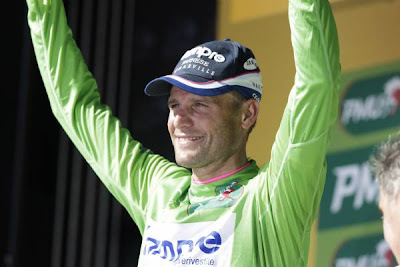 Thirty-six year old Alessandro Petacchi (Lampre-Farnese Vini) won two stages and the green jersey. It was a very close points competition ending with Petacchi scoring 243 points, beating Cavendish by 11 points and Hushovd by 21 points. "It's an outstanding result that, considering also the two stage victories, makes this Tour de France unforgettable," Petacchi said. "The green jersey is the best prize for the regularity of performances and of results: I always gave my best and the team was always perfect. At the beginning of the Tour the points classification was not my target but, stage by stage, I understood that I could be competitive and now I'm very happy that I decided to battle for this result. A special thanks to the team and to the sponsors: they were always with me, especially in the tough moments". Anthony Charteau (Bbox) won the mountains classification. Adriano Malori (Lampre-Farnese Vini), a TT specialist who did so well in the prologue (12th best time), was last in the GC at -4:27:03. "I'm happy I completed my first Tour de France at my debut," Malori explained. "I suffered in the early stages because of a crash which I was a victim of, but I did my best to recover and to be at the support of my team mates. The last place in the overall standing is not a problem for me, it's particular." Bravo. After losing the green jersey again on Stage 16, Alessandro Petacchi (Lampre-Farnese Vini) was able to regain it today on Stage 18. Finishing in 3rd place in the sprint Petacchi gained enough points to pass Thor Hushovd (Cervelo TestTeam) again. The stage was won by Mark Cavindish (his fourth; HTC-Columbia) with Julian Dean (Garmin-Transitions) finishing 2nd. Hushovd finished in 13th. "I performed the sprint with two targets," said Petacchi. 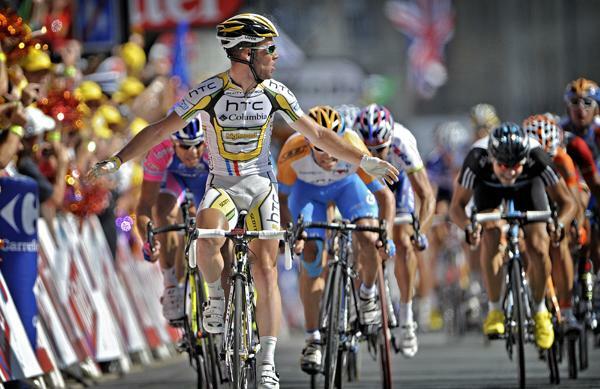 "One aim was to try to battle against Cavendish, who's now the strongest sprinter in the bunch. The other one was to take back the green jersey. When I noticed that Hushovd was not so brilliant in the moment before the sprint, I decided to anticipate and so I started to accelerate. Cavendish reacted in a quick way and he could overtake me, so I focused my attention on preceding Hushovd. 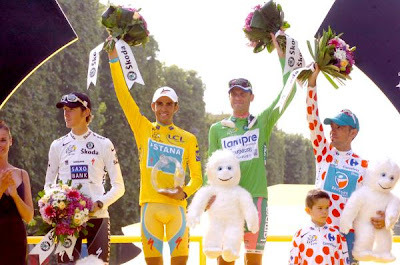 I struggled because I'm not as brilliant as in the early part of Tour de France, and also because of bronchitis. But, thanks to the support by my team mates, I could come back to first place in the points standing. I know that the battle will end in Paris: Hushovd and Cavendish won't give up". Daniel Oss, Liquigas-Doimo, won the most aggressive rider award today. Oss made a solo effort to win from the 14 km mark but was caught by the peleton at 3.5 km from the finish. 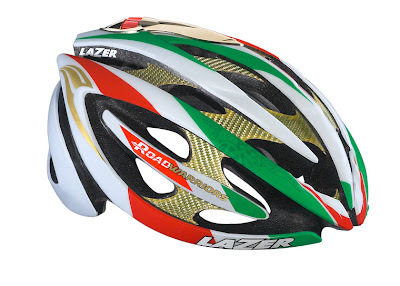 LAZER launched its limited edition Road Warrior helmet collection in June which includes a design in the Italian colors, as worn by Filippo Pozzato. For ICJ readers: My friends over at Velo-Retro are offering free shipping (to USA) on any Italian themed T-shirt order during the remaining days of the Tour de France; offer ends Sunday July 25th. The high quality T-shirts are available in 6 sizes and 17 colors. Go here, and then along the left side you will see the T-shirt designs organized by several categories. Contact them to let them know you're taking advantage of the offer and your shipping amount will be refunded after you order. SIDI, located in Maser (Treviso), has announced a new design for their triathlon specific shoe, the T-2 Carbon Composite. 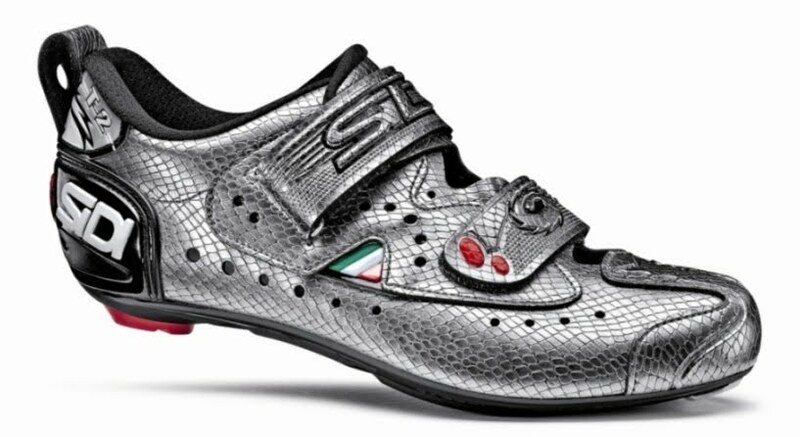 In addition to the original all white shoes, the shoes will be available in silver snake skin. 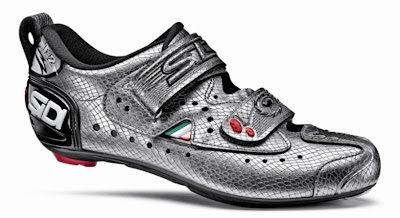 Versions of the shoes will be available for women and for MTBing. 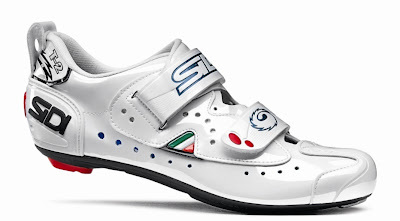 Beyond all the technology already applied to normal Sidi Sport cycling shoes, the T-2 Carbon Composite model features air ducts on the uppers which allow for major aeration allowing the athletes’ feet to dry completely after the swimming race and permitting them to breathe as much as possible during the cycling phase and in the build up to the final run. 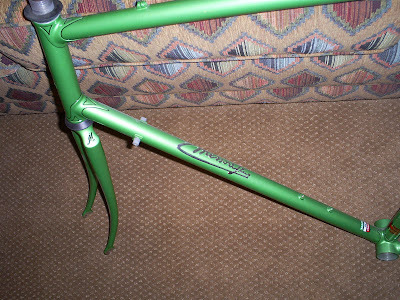 There is seemingly no end to the Italian framebuilders who names grace the downtubes of bicycles. Many are well known. Others are relatively unknown, their stories waiting to be told. In the latter category are the frames by Messori. 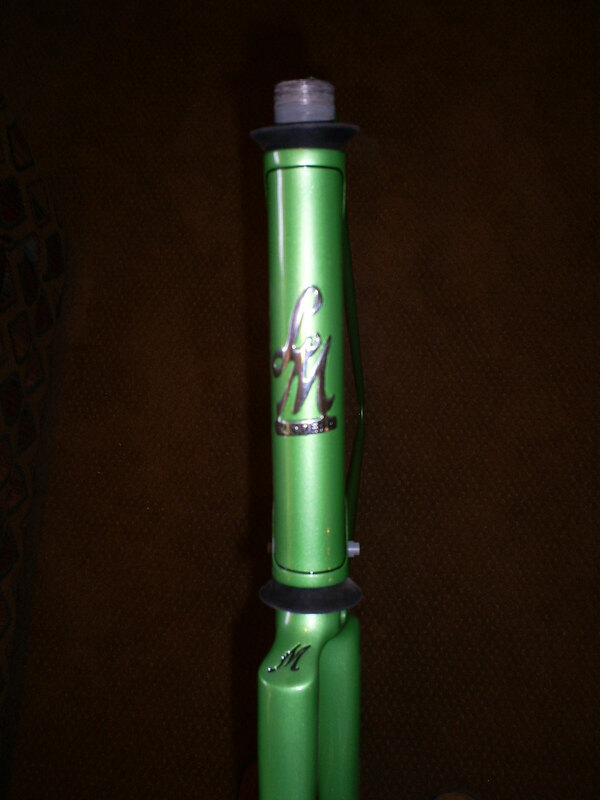 A reader of ICJ sent photos of his green Messori seeking more information. Note the brazed on logos. 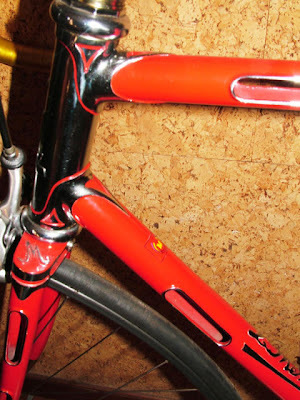 Messori also created a track bike with every tubeset carved out (see photos). One story has it that it was Messori who introduced this concept to Faliero Masi who then used it for the chainstays in the Masi "Fiera" bike(s) in 1974. Photos from the Thomson Bike Tours' "2010 Trans-Dolomites Challenge" which featured 56,000 feet of climbing in 7 days in June. 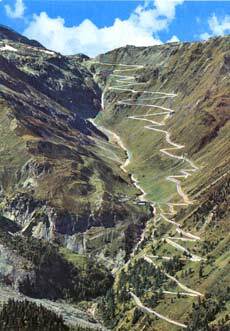 On the menu were Monte Zoncolan, Passo Stelvio, Mortirolo, Passo Gavia and the Ronde Sella over the Pordoi, Sella, Gardena and Valparola passes. Alessandro Petacchi (Lampre-Farnese Vini) is back to wearing the green jersey after losing it yesterday to Thor Hushovd (Cervelo Test Team) and winning it back today on the 13th stage. Alexandre Vinokourov (Astana) won the stage with a late attack, finishing 13 seconds ahead of the top sprinters. 2nd place was won by Cavendish, and Petacchi finished 3rd earning precious points over Hushovd who finished 8th. "The duel against Hushovd is very interesting and it will go on until Paris," Petacchi commented. "Today, thanks to the support of my team mates I could take back the green jersey. Now I have to pay even more attention to the intermediate sprints since Hushovd is skillful in joining breakaways. It will be a tough battle". ICJ reader Paul sends this photo of his recently delivered creation by Dario Pegoretti. It's no wonder that Dario's bikes are among those of a current exhibit of bespoke bicycles at the Museum of Arts and Design in New York City. The exhibit runs through August 15th. ....or any beer for that matter. Alessandro Petacchi finished in 2nd place today in a chaotic sprint in the 11th stage of Tour de France (Sisteron-Bourg les Valence, 184.5 km). He isn't bitter though as the 30 points for 2nd place makes him the new leader in the green jersey points competition. Cavendish was the stage winner. "Cavendish and his team performed a perfect sprint. It was very difficult to precede them, even if Lampre-Farnese's work was very good," Petacchi commented. "I'm sorry I didn't win, but I'm happy for conquering the green jersey: it's a beautiful prize for my teammates' effort and I'll try to keep it with me as long as possible". "It's not going to be easy to keep the green jersey until we reach Paris," Petacchi said. "Yesterday I went for the intermediate sprint because Hushovd, McEwen and I are very close in the points classification. We'll probably fight for other intermediate sprints. I'm confident after the good work done by my team today. The way Danilo Hondo brought me back to the front was exceptional." "My position now makes me think of the 2003 Tour de France," Petacchi explained. 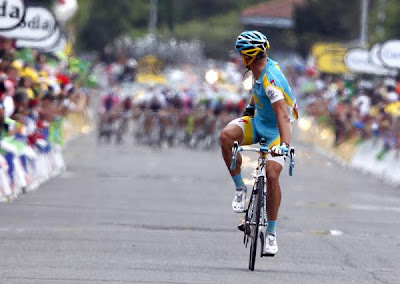 "Seven years ago, I didn't have the grinta (determination) that I have now to finish the Tour and win the green jersey. My directeur sportif at the time, Giancarlo Ferretti, was very upset when I pulled out of the Tour although I had the green jersey." Levi Leipheimer partners with BMC Racing Team’s Scott Nydam and cycling physician Dr. Max Testa to host exclusive GranFondo training camp in Sonoma County. 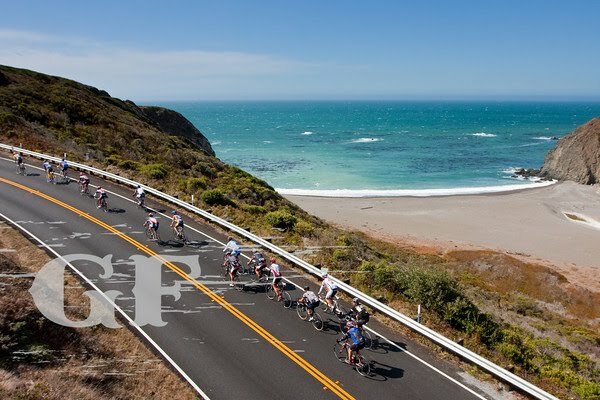 Combining local knowledge, years of professional cycling experience, and the scientific expertise of the sport’s most celebrated training physician, the “Massimo Fondo” training camp will coach twelve riders on Sonoma County’s most famous routes as a benefit for Levi’s GranFondo charities. SANTA ROSA (July 15, 2010)—Training for an epic event like Levi Leipheimer’s King Ridge GranFondo just got a little bit easier. Team RadioShack’s Leipheimer is teaming up with famed BMC Racing Team’s cycling physician Dr. Max Testa and BMC Racing Team’s Scott Nydam for a 3-day, elite level cycling training camp in Sonoma County. This is a unique opportunity for a few lucky people to experience the home turf of one of the world’s top cyclists riding by his side and under the medical tutelage of his own sports doctor. As an additional incentive, all proceeds from this exclusive training camp will benefit Levi’s GranFondo charities and cycling initiatives. Convening August 4th, 2010 and finishing August 8th, twelve cyclists will have the opportunity to undertake a true, three-day training block experience as they are guided through reconnaissance rides along the Gran, Medio, and Piccolo routes of Levi’s GranFondo. Riders will be accompanied by Nydam and Leipheimer as they traverse routes known as much for their beauty as their challenge. BMC Racing Team’s mechanic Rich Sangali will be providing bike inspections and tuning throughout the Massimo Fondo camp. Off the road, riders will have a personalized bike fitting to maximize efficiency and comfort, a lactate threshold test to determine effective training parameters, and a one-on-one consultation with Dr. Testa to discuss individual strengths and improvement areas. All Massimo Fondo riders will leave with a personalized training plan they can continue to improve and refine with the guidance and feedback of Testa and his assistants up until the day of the GranFondo. Massimo Fondo participants can also expect invigorating professional body work by a team of hand-picked massage therapists, led by Brenda Phelps, Team RadioShack’s own soigneur. In addition to the physiological benefits, participants in this event will be awarded a spot in the Levi’s GranFondo route of their choice, including the long ago sold-out Gran route. Massimo Fondo training camp participants will be given the full VIP treatment at Levi’s GranFondo, including a complimentary ticket to the October 7th Festa de Fondo auction dinner, access to VIP receptions before and after the October 9th main event, and exclusive mementos of their Massimo Fondo training camp experience. A new showroom for Cicli Taurus, a brand which has existed since 1908, is opening today in Legnano. Better know for their city bikes, they also made road models. Improved details to enhance control performance. At Campy Tech Lab™ they have been working in this direction, reducing weight and improving performance. A new front air intake and a new design will make your bike look more aggressive and confident. Red and white colors will immediately gain your attention, but the real surprise comes with the first shift; precise, extremely fast and with no hesitation. The new design in XPSSTM downshifting and up-shifting actuations have been designed and upgraded to offer the best possible shifting, even under extreme conditions of use. It's the soul of the new 11v Record™ transmission! Carbon fiber outer plate and cage plate. Upper and lower aluminum bodies are black, giving this shifting system - preferred by pros - a more aggressive look. It is one of the essential components - together with the chainrings and the cassette - of the exceptional Record™ 2011 groupset. Thanks to Ultra Shift™ technology, the derailleur cage is more rigid, while body and frame adjustment components cause the derailleur to be faster and more decisive. In competition every little detail counts; that´s why steel and titanium were used when producing Record™ sprockets. The perfect teeth design results in a perfect synchronization between shifting and chain movement. Pros are the everyday testing ground for the chain fitted on all advanced Record™ 11 and Super Record™ 11 groups. An extra pivot has been added to the standard single pivot rear version for those who want an immediate and decisive brake response. Braking power results from both our Skeleton design and the new brake shoe combination. The shoe holder allows for better regulation and helps to improve the friction surface. The ergonomic design of the Ergopower™ body now made of a lighter and stiffer material enables you to grip the controls more firmly. The brake lever with double curvature and the classic double lever of the brake/shifter controls guarantee efficient braking in all conditions and easier operation. X.P.S.S.™ (eXtreme Performance Shifting System), the acronym that refers to the most efficient system ever, lets you shift with extreme speed and incredible precision. At first glance, the Chorus™ 2011 crankset does not show any changes. But actually there is plenty of news hidden behind the new look. The chainrings have been completely redesigned. The new teeth design plus the new 8 ascending and 2 descending zones of the chainring enable top-class performance. Chorus™ 11-speed's shifting precision is comparable to its older siblings Record™ and Super Record™. The design and geometry of the rear derailleur are exactly the same. The only difference lies in the materials used, which made it possible to keep a favorable price without lowering the performance levels. A groupset dedicated to competition like the Chorus™ 11-speed can't forego showing its true competitive spirit, and the carbon fiber front plate is the proof. This system is fast, responsive, and precise, and the chain shifts across chainrings with no hesitations. The Chorus™ 11-speed front derailleur, like all the others in the 2011 range, are compatible with standard crank sets and the Compact™ .The geometry of the fork and the movement of the front plate have been designed and optimized to obtain maximum performance when used with the other Campagnolo® 2011 components. The six larger sprockets have a double frame system for extreme torsional stiffness, so that operating precision is maintained even during shifting under stress. The surface treatment of the eleven steel sprockets assures longer component life, maintaining the maximum performance through time. Fluidity, smoothness, and noise reduction: the 5.5mm Chorus™ chain fully meets the quality and performance standards of the 11-speed™ groupsets. The strength of the treated steel links is absolute, and the Ultra-Link™ closure system guarantees safety and the long life of the chain. The new compounds dramatically improve braking, and the new lighter pad holders make replacement easier and faster. The Ergopower™ controls are made of aluminum, both the brake lever and the shift lever dedicated to controlling the rear derailleur and front derailleur cable. A version in carbon fiber with core in light alloy is available as an option. The Athena™ controls employ Power-Shift™ technology, which enables multiple shifting (three gear cogs) upward and single shifting downward. The comfort and safety are absolutely the point of reference of the market thanks to the ergonomic supports on the main body and the double curvature of the brake lever that enables an effective grip in any situation. The most evident changes are immediately noticed on the first shift. The new design of the chain up shift and downshift zones makes shifting extremely fast and precise. The axle of Athena™ is the brand new Power Torque System™, which makes it possible to obtain very high values of torsional stiffness and efficient power transmission, without increasing the lateral bulk. The crankset is also available in the carbon fiber version that is more than 100 grams lighter. The Athena™ rear derailleur has the same geometry as the top-of-the-range 11-speed models, and absolute precision is the result. The outer plate wraps around the upper and lower bodies in aluminum, eliminating any possible play and making the overall structure of the rear derailleur extremely stiff. The result is fast and precise shifting in all the gears. The pulleys are specially designed to reduce vibrations and make the drivetrain perfectly quiet. Thanks to the Ultra-Shift™ geometry of the cage typical of all the Campagnolo® 11-speed groupsets, the chain can move between the gears of the crankset with the maximum speed and precision in any situation, even when "chain crossings" are extreme or under stress. The new Athena™ front derailleur is compatible with both standard and compact cranksets. You'll be amazed at its silence, fluidness, and durability. The Chorus™ 11s chain of 5.5mm width has been designed and constructed to guarantee riders the maximum in terms of safety and performance. The newly developed treated steel makes the links extremely resistant, and the Teflon™ surface treatment and Ultra-Link™ geometry make the chain smooth running and highly durable. The Athena™ groupset uses the Chorus™ sprockets. The Campy Tech Lab™ engineers have designed each single tooth to assure optimal drive train engagement along with fast and precise shifting. The positioning of each sprocket has been designed to reduce friction to the maximum and make the pedal rotation silent and efficient. The six largest sprockets are mounted on separate frames, which increase their stiffness. Campagnolo's objective is to provide both professional and amateur cyclists with the best braking system possible, adapted to their riding style. There are those who prefer to always have the maximum power available (dual pivot on the front and rear), and those, on the other hand, who prefer more controlled and modulated braking, with the mono-pivot in place of the dual on the rear brake. The new lighter pad-holder makes replacing pads fast and secure. 1984 advertisement from Bianchi (click to enlarge) discussing that they wanted to change the official Bianchi color from celeste to another color. 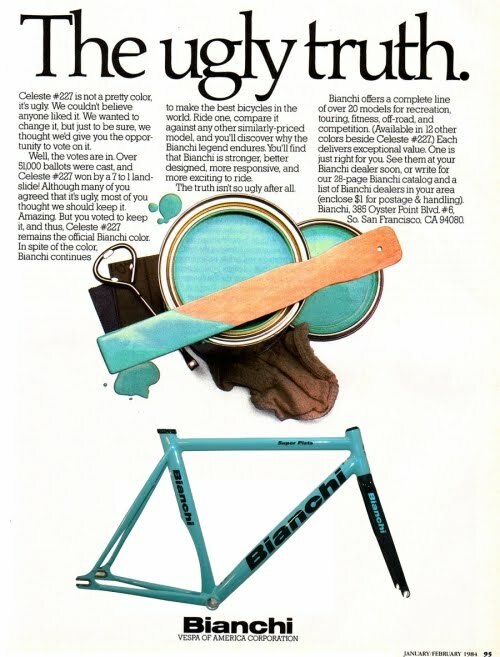 After a poll that had 50,000 respondents the choice was clear: celeste was voted 7 to 1 to remain the official color of Bianchi. Dominate your bike at every turn, relax on the long straights, and prepare for the final sprint: whatever your racing position, ErgopowerTM controls, with the exclusive Campagnolo® mechanism allows you to shift up 3 sprockets at a time and down 5 sprockets. Make every movement natural, fast and precise. The Super Record™ series Ergopower Ultra-Shift™ controls, now also available with red or white hoods, are the top product in terms of technology applied to ergonomics ? all to the advantage of safety, speed and precision in using the controls. Your every wish is a command. Shifting to ''higher quality''; the new chainrings have 8 pins to lift the chain and 2 to lower it. This whole re-designed system makes shifting from one chainring to the other very fast and efficient. The result: faster and more precise shifting than ever before, a huge step forwards compared to the past. CULT™ bearing technology guarantees a smooth and efficient pedaling action and a long lasting performance. For those who only want the best and look for unique and exclusive components, the central pin crank set and titanium fixing bolts will offer a very unique bike. 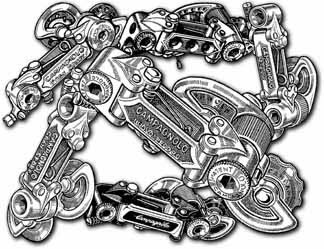 The masterpiece of the 2011 Campagnolo® model range! Speed, precision, smoothness and better looks: the first rear derailleur with carbon fiber upper and lower body will amaze even the most demanding of cyclists. Lower and upper bodies, outer plate, parallelogram: all carbon-made components. The white '11' on the red rectangle printed on the carbon fiber gives the Super Record™ 2011 version a more aggressive and unique style. The Super Record™ derailleur is light, fast and precise, thanks to the careful selection of materials and Ultra-Shift™ geometry that helps components perform at their best. Thanks to the new chainrings and chain design, the shifting system is much faster and more precise than ever. All your power is transmitted by the transmission component: the chain. Super Record™ groupsets include Record™ chains: fast, long-lasting and safe. 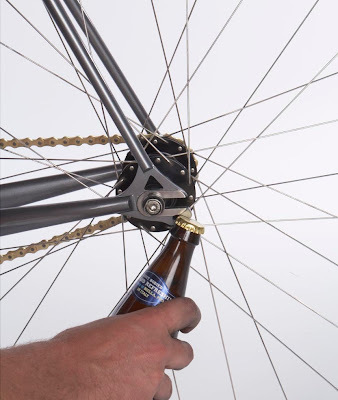 Links and pins have been designed to adhere perfectly to the teeth of chainrings and sprockets to reduce friction. There is no power loss and component life is extended. The Super Record™ system guarantees shorter braking distance and complete control of breaking power thanks to our Skeleton™ arm design and new brake pads. In its standard version Campagnolo® offers the classic front brake Dual Pivot and rear brake Mono Pivot design to provide maximum braking power modulation. But for those looking for the maximum braking power, even at the rear, Campagnolo® offers the rear brake Dual Pivot option. 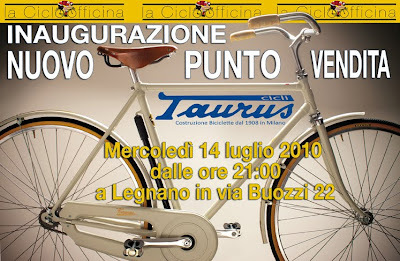 Information about Centaur and Veloce 10 speed for 2011 here. Thank to readerArnoud for bring the Super Record 11 2011 information to my attention. 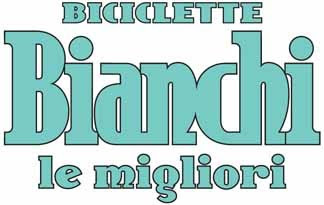 All Bianchi Production Leaving Italy? !